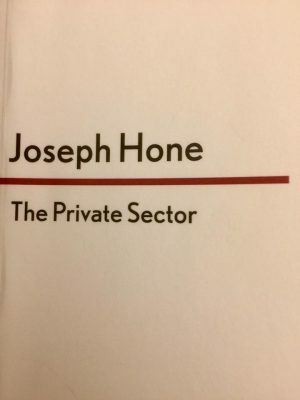 Review of The Private Sector by Joseph Hone…. In 2014 Faber and Faber reprinted the four book series of Peter Marlow stories by the late Joseph Hone. All four novels were published with the same plain white cover with a singular red line separating the author’s name from the book title. It was a clever move by the publishers who, under the sub-company of Faber Finds, emphasised what those in the know have long known, the words inside speak for themselves. Hone, like his novels never received the level of recognition that he deserved. For someone whose writing was, quite rightly, compared to Greene and the better works of Le Carré and Deighton he eschewed book sales for literary credibility. Unlike Greene he didn’t write with more than an eye on the silver screen and fame never magnified his feeling of self importance in the manner and to the detriment of post Smiley Le Carré. Like Deighton, Hone proved that the spy novel could be written as a piece of literature and regarded in the same vein without the snobbery of the literary set. But whilst Deighton mastered the art of fluidity in conversation to build a story, Hone created a world in which Greene, Burgess or Orwell might easily have been credited with. In The Private Sector, the first volume in the Peter Marlow series, Hone draws on his own experiences to create a story based in Cairo and London between two months a decade apart, May of 1957 and 1967. Like Greene, he concentrates on the ‘human factor’ in the life of a spy. Marlow falls into the intelligence world, a sweat-stained, gin-soaked teacher as far removed from the scores of Bond copycats which flooded the market at the time of publication. In Anthony Burgess’ Malayan Trilogy we can almost taste the warm beer, feel the cold sweat of their fevers and realise their longing for England’s green pastures. This takes a certain type of author, the detail comes in the lack of it. Too often a modern author labours on a detail designed to ‘educate’ the reader. Food and drink are worked to death, we are meant to believe everyone drank a Tom Collins under a ceiling fan wearing crisp linen. Hone knew better, he knew the heat in Cairo, how the expat’s wore their crumpled shirts stained with sweat and ordered thirst quenching Stella in dark, pre-air conditioned hotel bars as they waited for the relief of sunset. Marlow drank the local whisky and gin, the branded booze long since departed with British rule and drank to forget the depression of lives ruined by fear, deception, broken marriages and lost causes. In Jeremy Duns’ preface to the 2014 edition he pays tribute to the balance Hone strikes between the desk-bound intelligence gatherer and the field agent. Marlow becomes both and we are irresistibly drawn into a melting pot of intelligence agencies operating in the same, sun-scorching arena. Hone captures brilliantly the misplaced loyalties, the double-crosses and sense of dread that comes with the realisation of abandonment. At it’s heart it is a classic chessboard tale of espionage in which the pawns are left exposed to the cryptic plans of their superior playmakers. Hone reveals the so-called Great Game for what it was, he creates a love story throttled by deceit and bitterness, engages the reader with the politics of the day whilst taking us through the shimmering, cracked pavements of a Durrell-lite landscape. A beautifully written book by an author unwilling to accept the confines of the genre.